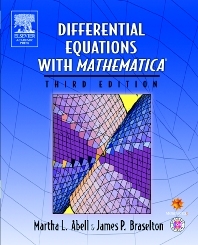 The Third Edition of the Differential Equations with Mathematica integrates new applications from a variety of fields,especially biology, physics, and engineering. The new handbook is also completely compatible with recent versions of Mathematica and is a perfect introduction for Mathematica beginners. Professional and student mathematicians, engineers, and scientists. Ch. 1 Introduction to Differential Equations: Definitions and Concepts; Ch. 2 First-Order Ordinary Differential Equations: Theory of First-Order Equations; Ch. 3 Applications of First-Order Ordinary Differential Equations: Orthogonal Trajectories; Ch. 4 Higher-Order Differential Equations: Preliminary Definitions and Notation; Ch. 5 Applications of Higher-Order Differential Equations: Simple Harmonic Motion; Ch. 6 Ordinary Differential Equations with Nonconstant Coefficients: Cauchy-Euler Equations; Ch. 7 Laplace Transform Methods: The Laplace Transform; Ch. 8 Systems of Ordinary Differential Equations: Review of Matrix Algebra and Calculus; Ch. 9 Applications of Systems of Ordinary Differential Equations Mechanical and Electrical Problems with First-Order Linear Systems; Ch.10 Eigenvalue Problems and Fourier Series: Boundary Value Problems, Sturm-Liouville Problems, Fourier Sine Series and Cosine Series; Ch. 11 Partial Differential Equations: Introduction to Partial Differential Equations and Separation of Variables; Appendix: Getting Started.